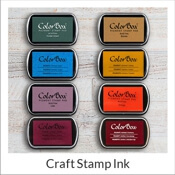 We have a variety of stamp ink and pad color choices to choose from. We are able to custom produce self-inking stamps with 2 colors or more at special stamp request. Here is a useful guide to your choices for color stamps. 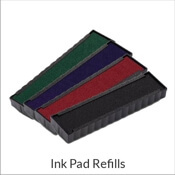 Each stamp pad for both hand stamping and self-inking is available in the following colors as a standard: Red, Black, Blue, Green, and Purple. If you are in need of extra colors such as Pink, Orange, and Brown we are able to produce these as well but as a general reference we do not keep these colors stocked at all times. 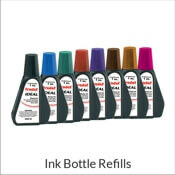 Special Inks: We carry special color ink types for everyone from the common club stamp needing invisible ink to the average business in need of permanent waterproof stamps. Fluorescent stamp ink, (ultra-violet stamp ink, invisible stamp ink, etc) is great for keeping track of any guest list without making a visible mark to the receiver. Invisible ink stamps are available only as traditional hand stamps and require nothing more than a traditional rubber stamp and a fluorescent stamp pad. Please use a special stamp request for all invisible stamp ink. We also offer permanent stamp ink for otherwise difficult-to-stamp objects. Stamps with permanent color are even quick drying for the fastest and most reliable stamp impression possible. Great for high-gloss surfaces such as glass stamping, metal stamping, plastic stamping, clothing stamping, and glossy paper mediums. The fast drying permanent ink is also water resistance to ensure that your message will be carried for a time to come and won't smear or rub off. Permanent stamps are available for traditional hand stamp use only and by special stamp request. Need a sticker for every mirror in your building? Use a permanent stamp. This immensely cuts down cost and even saves resources. Glass stamping is a great way to get your stamp information on a window or mirror without the need of a sticker mess. Permanent stamps, fast drying stamps, whatever you'd like to call them - they get your rubber stamp secured to glass. Stamp your brochures! With most brochure paper being of high gloss, the simple solution is quick drying permanent stamps. Need to stamp fast? A self-inking stamp is the natural choice. 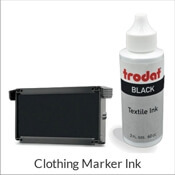 Our primary ink for self-inking color stamps is Ideal ink. Our top selling stamps are our personalized line of self-inking address stamps and our top selling self-inking stamps model is the Ideal 100. 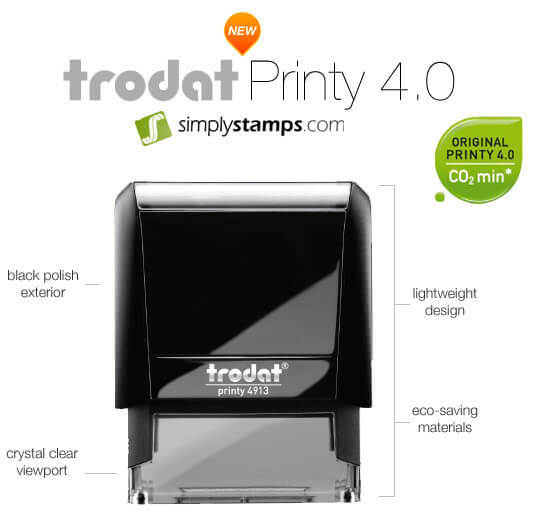 Ideal has since merged with Trodat stamps as the Trodat P4 models, which are the most recent standard. For pre-inked stamps we also carry Ultimark small ink bottle and Ultimark large ink bottle colors. Listed below are our color options available in our standard Trodat stamps. Black, Red, Orange, Green, Blue, and Purple. Black Stamp - The most popular of our color options. This stamp color is not especially useful when the rubber stamp message needs to be noticed. Black is the most frequent color for our stamps. Red Stamp - Official in all senses of the word, red rubber stamps are notorious for their urgency. It is able to give the tone of any document a serious message conveyance. Orange Stamp - Not to be ousted as exceptionally good at eye-catching by other bright colors, orange is able to provoke without coming across "too harsh". Ensures your stamp message will be delivered without the common perception of being as offensive as red, as well as not having the official tone that goes with it. Green Stamp - The best way to provoke positive attitude via rubber stamp. It gives any reader an instant feeling that generally is associated with acceptance. Use of green as a rubber stamp is an excellent method of giving documents a positive tone to the reader. Blue Stamp - A calming yet very apparent color for rubber stamps on all documents. It is naturally neutral in use and is primarily a decorative alternate to black. Purple Stamp - This color is most commonly associated with royalty and wealth in English societies. Purple is not very popular and is mainly used for decorative purposes in rubber stamping.Purple is spread throughout all rubber stamps.